Super Mario Run’s Toad Rally is my favorite game mode and I am sure you too will find it quite fun and engaging. This game mode pits you against a human player. You and your opponent have to race against time and try to collect as many coins and toads before the timer hits zero. The one who collects more coins and toads wins the race. Collecting coins is easy. Your character runs into coin trails and all you have to do is guide him by tapping the screen at the right moment to make him jump and collect them. 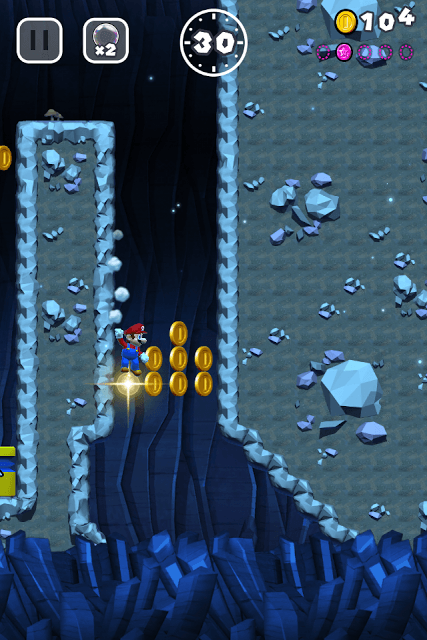 You can also press and hold the screen to make your character jump higher up in the air to catch coins. 1. Doing a consecutive wall jump between two walls can make them jump with joy. To do this, quickly tap the screen when your character goes close to a wall. This will make him hit the first wall and jump towards the second wall. When he hits the second wall, tap again to make him bounce off that wall and hit the first one again. This is how you can pull off a consecutive wall jump. Do this in courses that have walls. 2. When your character jumps over small enemies and obstacles he/she performs “Vaulting” move, and the good thing about this move is that you don’t have to tap the screen. But if you want to impress toads, just perform the “Vaulting Jump”. To do this, just tap the screen when your character jumps over small enemies or objects to make him jump higher. 3. Do the Rolling Jump. This can be done when your character hits the ground and rolls. You just have to tap the screen when he/she rolls. Rolling Jump can be pulled off when the character does a “Landing Roll”. Tap and hold the screen to make your character jump higher above and pull your finger away. Your character falls and then breaks the fall by rolling on the ground. The rolling part happens automatically, so you don’t have to tap anything. To get some toad love, just tap the screen when your character rolls. This will help him pull off a rolling jump. 4. Another neat stunt is the Climbing Jump. This move will make those toads scream with joy. To perform this stunt, you should know how to climb an edge. Your character automatically catches edge of a pipe or a platform and pulls up. A simple way to climb the edge of a pipe is to make your character stand close to a pipe and then tap the screen once to make him jump, he will automatically catch the edge of that pipe and climb up. While he is climbing, tap the screen once to perform “Climbing Leap”. 5. Stomping several enemies in a row can also get you toads. Plus you get bonus coins for this move. You can try this move on Goombas. They show up everywhere and usually walk in a straight line. When you spot a group of goombas, tap to stomp the first Goomba and then tap again to stomp the next one and so. This is how you can pull off consecutive stomps. 7. Losing a rally will deduct a certain number of toads from your total and you will lose all toads you have gained from a rally course. Always try to win a rally. If you have just started playing the game, choose an opponent that has lower number of toads. An opponent with a higher value may be tough to beat. 8. Your first objective is to collect as many coins as possible. You can pull off special moves in-between running, jumping and collecting coins to gain toads. Keep an eye on pink coins. Collecting one pink coin adds more coins to your total. Grab them before your opponent does. 9. Reach the mini black flag before your opponent to get 10 extra coins. Also do the Vaulting Jump and other special moves to fill up the Coin Rush meter faster. When the meter is full, big coins will appear on the screen. A big coin equals more coins, so collect them before the Coin Rush meter is empty. 10. To participate in a Toad Rally, you will need to shell out tickets. The good news is that they are quite easy to get. You might get a ticket by winning a race. You may also get a ticket if you collect 5 pink coins in a Tour level. You can find pink coins hidden in Tour levels. Explore each level to find and collect all 5. You might not get a ticket as the rewards range from bonus coins to tickets every time you collect 5 pink coins in a level. Just make sure you collect all 5 pink coins in a row in any level. If you collect only two or three coins, then it will be of no use. The level will reset and you will have to start again and collect all 5 pink coins. 11. Another way to get tickets is by entering a special building called Bonus Game House to play bonus levels. To find Bonus Game Houses, go to the Build mode, tap the Shop icon and then tap “Specials” (Star icon). A Bonus House lets you play a fun level once in every 8 hours. A bonus level contains a chest that may give you a free ticket. When this level starts, you will have to keep choosing doors to reach the final door that leads to chest. The ticket will be hidden in one of the chests. There are three game houses: Red, yellow and Blue. You will get the Red Bonus game house for free at the beginning of the game. 12. Are you getting only red colored toads? Well, this is because you haven’t reached new worlds. Advance to a new world and complete its levels to unlock a new rally course. As you keep completing more levels, new courses will be unlocked, giving you an opportunity to collect blue, green and yellow toads. Different types of courses will give you different toads. For example: You can get yellow toads from sandy rally course. The toads you collect are used to unlock buildings, specials and decorations. They come in 5 different colors: Red, Blue, Purple, Green and Yellow. To unlock a building, you will have to collect an X number of certain color-coded toads. For example: To buy a Super Mushroom statue, you will need 300 Red, 300 Green and 300 Purple toads. Notify me when new comments are added.